The Shusaku kosumi is now white? Rozzychan: In the second game with Akira Toya, Akira takes two of Hikaru's stones, and yet when they show the entire board at the end of the game, those stones are no longer in the cup. naruto3: In game nine it says that Hikaru has lost to Tetsuo Kaga by half a point with komi. But in the corner it is possible to force Tetsuo to play a move inside his territory. If Tetsuo refuses to react Hikaru can take and capture five of Tetsuo's stones. So no matter what Hikaru wins. Mitani says he should just let kishimoto have the ko he plays here (1). Then Kishimoto plays here (2) and takes the ko. So the board should look like this (3). jms Maybe Mitani cheated, even though he swore he wouldn't? Or maybe the artist simply slipped up. Naustin-- This is shown in the community center class Hikaru attends. It is stated that after the marked black move "even if white were to play black's move, black captures two stones. Then all of white's stones in this area are dead." I can't see how this is true though. 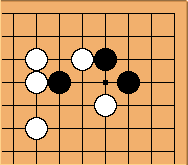 It seems to me if white plays 'a' white will live even without skipping a black turn. Chris Hayashida: You might want to look at HikaruProblem9. It discusses the problem, as well as the translation issues. Shaydwyrm: I'm not sure what the bit about white playing black's move is all about, but here is a simple killing sequence for black. Zarlan: Actually I checked with my Hikaru-scans (haven't bought the manga. Yet) and he says: "This is Black's best move. Even if White does this, let him take your two stones, but surround him. Then take this eye and White is dead." Dart? : Isn't it white to play? The red circle stone was blacks last play? White lives if its white to play, but there's many ways to kill if it's blacks turn. But then again, I don't know the anime, so from reading it, it looks like it should be white to play. Zarlan: Yes. In Naustin's diagram and in the manga the "circled" stone is black's last play, so it is white's turn, but whatever white does, it does not live, because black can kill it as you see in the following diagram (I have marked white's first move). Feel free to prove me wrong by showing a way for white to live. No matter what white does he's lost if black plays 3 here. Chris Hayashida: This diagram isn't right. is self-atari. Warp At least in the anime, in the first game of Sai vs. Akira (first episode) there are some errors in the game. (This game is in reality a game of Shuwa vs. Shusaku so it's easy to check these errors comparing the game to the sgf). At one point this closeup is shown. 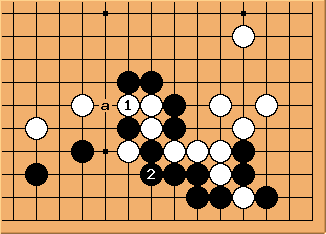 In the original game the marked white stone is black. This is not a case of artistical freedom (ie. the anime authors changing this on purpose) because in a later shot this stone is indeed black. This seems to be clearly an error in this specific shot. the first game of the pro exam (anime) hikaru plays what looks like the first move as black. Both clocks show 2:59, but white's should still be at 3:00.
mdm: This is correct. Both clocks should show 2:59. The additional minute is byo-yomi. If you look at commentaries of professional matches (e.g in "The 1971 Honinbo Tournament"), you will see that the players ending in byo-yomi are listed as having used one minute less than the time limit (e.g. 8:59 if the time limit was 9:00). Ren: Interesting. So the last minute is considered to be played over and over again until the game is over? I appreciate the elegance of this solution. Warp: In the anime episode 17 Sai (with the aid of Hikaru) starts an internet game against Akira and wants to test whether it's the real Akira or not. For this they start playing the same moves as in their second game (anime episode 3). At one point Sai says (at move 6) "He's made the same moves as last time, so far." However, this is not true. In their second game Akira played two hoshis (Sai even thought in that game "Star again? 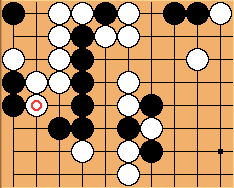 Unthinkable in the age of Shuusaku"), but here Akira played a komoku, not a hoshi, as his second move. Jon5? : In anime episode 55 when Akira's friends log on to see Touya Meijin and Sai playing (19.14), the game listing shows John Lennon. tapir: It's not a mistake, it is a feature. redwalljp: In series 4, Episode 4 "A game of Desperate Measures" (Game 49), the above position is shown (at around 6:50) and white plays 1, followed by black connecting at 2. Surely black should have captured the three plack stones at a instead of playing at 2?